Kris Aquino, daughter of the late former president Cory Aquino and former senator Benigno "Ninoy" Aquino Jr, gave a message to the critics of their family, saying that they are only tough on social media, but her family has gone through life-threatening situations and are not scared. This was a tribute to her parents on Father's Day, June 17, in a live broadcast over social media. "Taas noo ko kayang sabihin sa inyo, hindi kami umalis. 'Di kami duwag. Kung kayo, matapang lang sa social media, eh kami harapan... Nabaril na. Ilang beses binaril, pero nakatayo pa rin at nandito. Namatayan kami, si Noy nabaril, kami ilang beses. Naduwag ba kami? Hindi. So, Happy Father's Day, Dad. You raised good children because you gave us the courage to be Filipinos," she said. The video was a surprise that her two sons, Josh and Bimby did in collaboration with her. The message was a part of a question and answer portion she had with Bimby, where she spoke about her parents. Aquino said, "I am who I am because of the sacrifice my dad gave and because of the strength my mother showed." 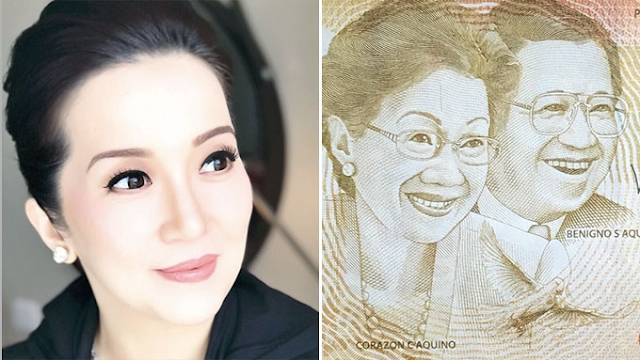 It can be recalled that Aquino previously lashed out on Communications Assistant Secretary Mocha Uson for posting a clip of Ninoy getting a kiss from two women moments before he was killed in 1983, allegedly insulting her family.